A number of imaging projects have been, are and will be undertaken in order to make the material in the herbarium more easily accessible and usable for people worldwide and in partial fulfilment of the Herbarium’s commitment to data repatriation under the Convention on Biological Diversity. Imaging has allowed easy access to certain materials such as Harvey's Travelling Sets of Algae. These specimens are never sent on loan as they consist of bound volumes each containing historically valuable material of many species. The following paper gives details of this collection. Parnell, J.A.N., Womersley, H.B.S., Sinkora, D., Vaughan, A. & Huisman, J.M. (2010). W.H. 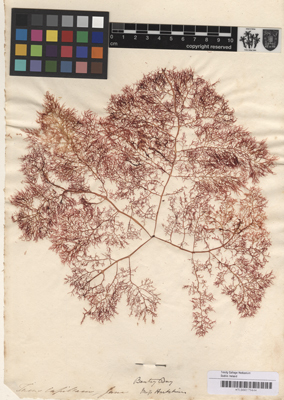 Harvey's Australian Travelling Sets of Algae in the Herbarium of Trinity College Dublin (TCD) and the National Herbarium of Victoria (MEL). Biology and Environment (Proceedings of the Royal Irish Academy), 110B: 119-161. As you will see from this document Harvey's Travelling Sets of Algae originate from Ceylon, the Friendly Islands and Australia. There are seven books of specimens from Australia and one each from Ceylon and the Friendly Islands. Funding from the Mellon Foundation has enabled all type specimens that have so far been recognised as such and many others of historical interest to be imaged and a database to them (PENELOPE) has been created. These images are available through JSTOR or via a direct request to the herbarium. There are, however, many types that await recognition and, therefore, await imaging.